One for the real Chicago aficionados! 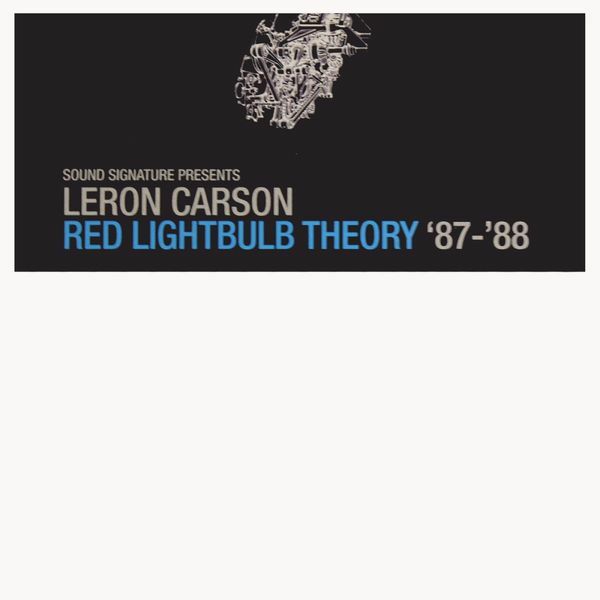 Leron Carson was a 15 year old kid playing around with drum machines and synth keys in 1987-88, when he produced the five tracks on 'Red Lightbulb Theory'. The tracks apparently languished away in his basement until Theo Parrish released 'China Trax' split with his own 'Insane Asylum' on the Sound Dignature classic '1987 EP'. Now eight years down the line, or 22 since 1987, Leron is afforded his own doublepack, rounding up those early handmade experiments with a little bit of engineering revision from AOS aka Omar-S. All the tracks were produced in that early Chicago style, meaning no sequencing and lots of cassette tape overdubs, hence the inimitably raw and psychedelic wow-and-flutter between the grooves . This style was simply the method of working for Chicago cats like DJ Pierre, Steve Poindexter or Armando (and continued by Jamal Moss), before they had flash multitrack recorders and had to make do with the primitive tools at their disposal, directly sketching down the ideas they needed to hear. It's with that sensibility in mind that Carson's tracks jack so intuitively, as the arrangements were made on-the-fly, or in-the-moment for that tuned-in dancefloor feeling If you like your Chi-town sh*t real, raw and old-skool, this is it! Killer.